Sugar substitutes (sometimes called low-calorie or artificial sweeteners) are ingredients used to sweeten foods and beverages instead of sucrose (sugar). You’ll find a variety of foods on the market that contain sugar substitutes; some food companies advertise this but you may need to look closely at the ingredient list to find out if a food is sweetened by a sugar substitute. Some products that contain sugar substitutes are diet soda and sugar-free syrup, gum, low-calorie ice cream, fruit cups, yogurt, pudding, and more. If a food tastes sweet but is very low in calories, chances are that it contains sugar substitutes. There are different kinds of sugar substitutes including artificial sweeteners, stevia, and sugar alcohols. There are some benefits and some possible downsides to using sugar substitutes. Products containing aspartame have a warning label because they are NOT safe for use by people that have the hereditary disease Phenylketonuria (PKU). Pregnant women may be advised by their doctor to avoid saccharin due to the unknown long-term effects. 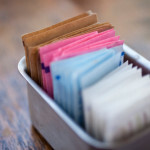 Six sugar substitutes have been “generally recognized as safe” by the U.S. Food and Drug Administration (FDA): saccharin, asparatame, acesulfame potassium, sucralose, neotame, and advantame. The FDA has also set an “acceptable daily intake” (ADI) for each sweetener which is an amount they feel is safe to have each day. It is measured in milligrams per pound of body weight per day. These amounts, listed in the table below, are based on a 132 pound person and are higher than the amount most people should have in a day.